No, you don't have to go on a boat to see whales if you are here during the right time of the year. It is common to see people standing on a hillside overlooking the ocean and watching the signs of distant whale activity through binoculars. You can often SEE whales from shore ... but you can't EXPERIENCE them from that distance. There is a tremendous difference between watching a whale splashing in the water two miles away and experiencing the thrill of looking over the edge of the boat and having one of these gentle giants swim directly underneath you. If you are here during peak season from December 15th to April 15th, do yourself a favor and go on a whale watch. NOTE: Most whale watches will be operating starting Christmas week and continuing through early to mid April. Our favorite whale watch ... it's F-A-S-T which means you spend more time watching whales and less time looking for them. The Explorer is a hard-shelled boat with an inflatable edge (like a large zodiac) which gives a fast, smooth ride and a front row seat for every passenger. The speed of these boats adds another 15-30 minutes of actual whale watching during a two hour whale watch compared to larger boats. This boat leaves from Lahaina harbor, and they have trips daily at 8am, 10am, 12:30pm, and 2:30pm. Please note that the size of this vessel means that the ride is more adventurous than larger boats. NO CHILDREN UNDER 5. Whale Explorer is offering a WHALE of a combo deal ... go on one of their morning snorkel trips to Lanai and save $15 per adult off the list price of a whale watch. For more information on this special combo, see our Lanai dolphin page. 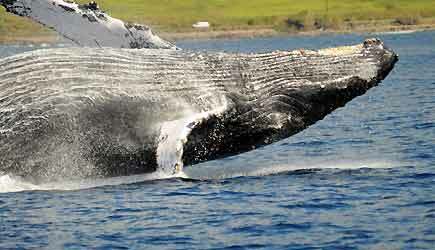 Experience the majestic humpback whales aboard a fast, fun, and comfortable boat! 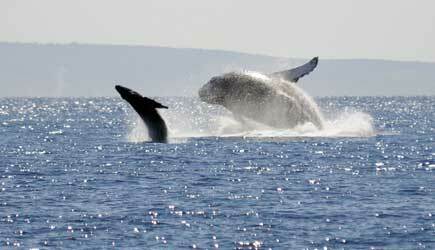 Makai Adventures brings you to the most active whales quickly, which allows for the most whale viewing time. 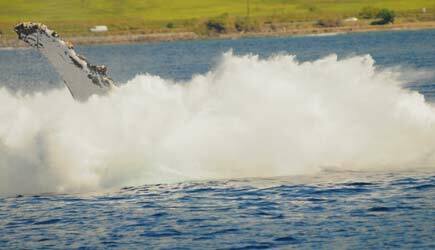 Their 37 foot Premium Custom powerboat has perimeter seating which ensures that no one get a center seat and 360 degree views. And there is half shade and half sun, so you can choose your desired seating. It also features a spacious open platform, making it ideal for photographers! 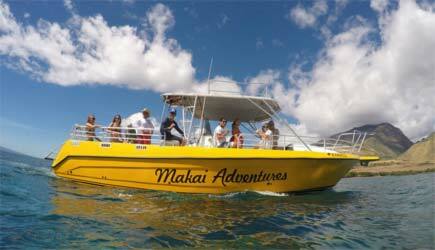 Makai Adventures limits their tours to 24 passengers or less, which creates an intimate and personal experience. They love getting to know their guests and sharing what they know about the islands and the whales. This tour departs from Lahaina Harbor Slip #16, and runs daily. Early bird is offered at 7:30am (6:45am on MWF), morning tour is 9:45am (9am on MWF), midday tour is 12:30pm (11:15am on MWF), and afternoon tour is 2:45pm (1:45pm on MWF). In an effort to reduce plastic out of our landfills and ocean, Makai Adventures provides a jug of ice water for you to refill your reuseable bottles or the provided paper cups. They also provide soft drinks and juices. Their boat has swim step with easy ocean access stairs, an onboard bathroom, dry storage space for your things. 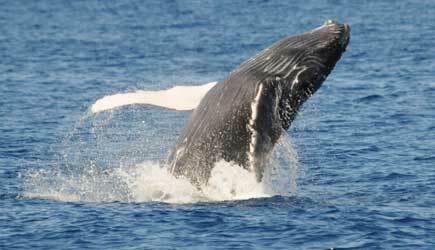 Makai Adventures guarantees whale sightings or your next trip is free! The minimum age for Makai whale watches is 3. Departing at 7:30am offered on Monday and Wednesday only from Kaanapali Beach, the Teralani offers a two-hour whale watch with breakfast snacks, kona coffee, tropical juices, and Teralani "Pogmosas". The Teralani is a beautiful sailing catamaran that pulls right up to Kaanapali Beach and you take off your shoes and walk across the sand to get on board. Departing at 10am every day except for Saturday from Kaanapali Beach, the Teralani offers a two-hour whale watch with a continental breakfast, kona coffee, tropical juices, and Teralani "Pogmosas". 10am is considered to be "prime time" for whale watching and is the time slot most likely to sell out the furthest in advance. Departing at 12:30pm every day except for Saturday from Kaanapali Beach, the Teralani also offers a two-hour early afternoon whale watch which includes dry snacks, beer, wine, soda, and juice. 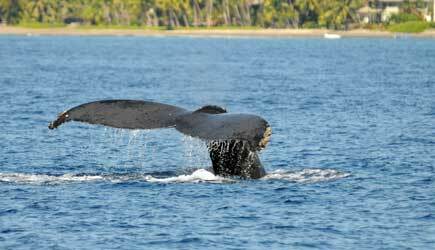 The Teralani operates their whale watch until April 1st. This 3.5hr Whale Watch tour departs at 1:30pm and operates 6 days per week (Monday through Saturday). Experience the Pride of Maui's spacious and stable vessel with many amenities and comforts including their large deck space. The sprawling upper deck provides 360 degree sweeping views so you can photograph all of the beautiful whales. 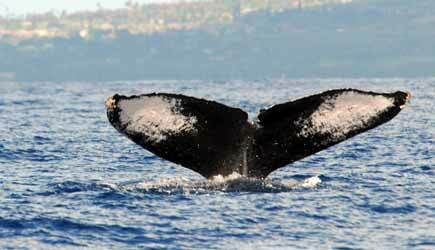 This tour guarantees whale sightings, and includes 1 hour for snorkeling. The tour also includes lunch and a full stocked open bar with microbrew Beers, wine & Mai Tais. Bring a camera, sunscreen, sunglasses, and picture ID required to consume alcoholic beverages. 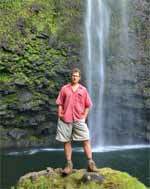 Pride of Maui provides "reef safe" sunscreen, and they use eco-friendly cleaning supplies. They use organic and biodegradable cups, straws, and serving ware. 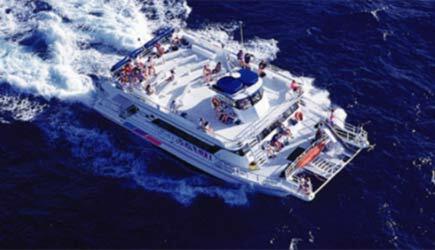 Pride of Maui operates their afternoon snorkel / whale watch from January through March. Departing from Kihei Boat Ramp, Blue Water Rafting offers 90 minute tours on their high-speed RHIBs. (Rigid Hull Inflatable Boat). The speed of these rafts gets you to the whales quickly, and the waters off Kihei are shallow and many whale calves are born in this area. This is a great option for those who don't want to drive to the west side of the island. Dedicated whale watches are held daily at 8am, 10am, and 12pm. 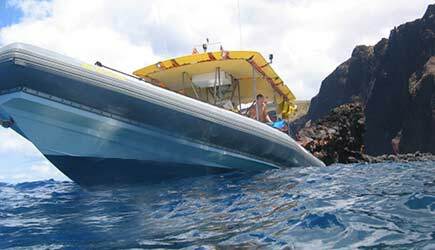 (They also offer a whale watch / Molokini Express combo found on our Molokini page.) Note: No one with neck or back injuries, no one pregnant, and minimum age is 5. 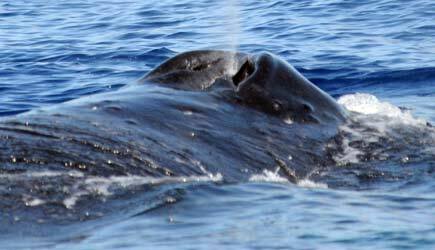 Blue Water Rafting operates their dedicated whale watches from January 15th to March 15th. 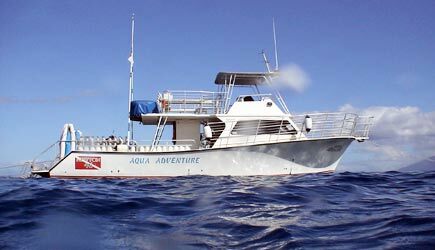 Aqua Adventures operates a morning snorkel tour to Molokini, but is available for exclusive private charters for whale watching and sightseeing in the afternoons. 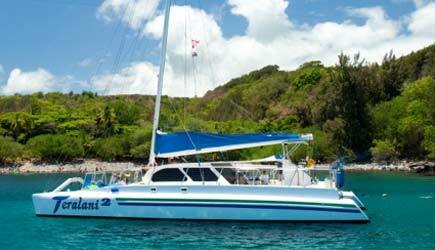 Departing from Maalaea Harbor at 1pm, the trip is 2.5 hours long and the rate includes a crew gratuity of 15%. Aqua Adventures can accommodate groups of up to 40 guests on an afternoon whale watch, or offers an affordable way for a larger family to have an exclusive whale watching experience. Please note that Aqua Adventures does not sell individual seats ... they only operate whale watches as exclusive private charters. Please include the approximate number of guests when making your reservation using the form to the right. Ultimate Whale Watch tours have fast and safe rafting vessels that are low to the water and perfect for close encounters. The small groups make every seat a front fow seat! They guarantee whale encounters and tickets support marine life research. You will learn more about whales from the marine naturalist guides, and even get to hear whales through a hydrophone. Their vessels Wiki Wahine & Wahine Hana are 27ft long. Coast guard approved for 24 guests, and they only allow 18 guests on boat. There are some seats and some pontoon seating. These vessels do not have a bathroom. The Wahine Kai vessel is 42ft long. The coast guard approved for 32 guests, and they only allow 26 guests on boat. It has most regular seating and some pontoon seating. Wahine Kai also has a bathroom and freshwater shower onboard. All of their vessels are low to water with 70% shade. All whale watch tours includes purified water and reef safe sunscreen. They depart from Lahaina and are offered daily. Minimum age is 4 years and no one with back or neck injuries or pregnant women. The 2 hour Whale Watch is their most popular tour, and it is offered at 9:30am, 12pm, and 2:15pm. It holds between 18-26 passengers on either the Wahine Kai, Wiki Wahine, or Wahine Hana Vessel. This tour has 14 passengers with more time on the water for whale lovers! It is an excellent choice for anyone looking for extra time with the humpback whales! 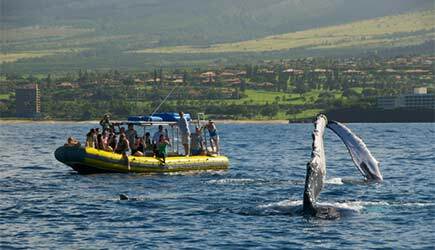 There are less people onboard and more time for whale encounters along Maui's scenic coast. Photographers will enjoy this tour because there is more time on the water and access from the boat for underwater photo or video. This tour is offered at 7am departure. This tour is all about the VIP treatment! 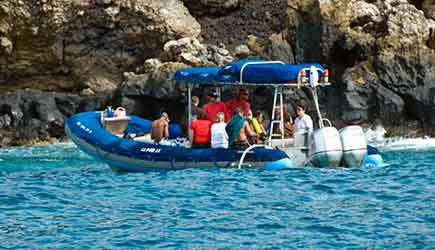 With only 12 guests onboard, this intimate group creates a causal and relaxed Maui whale watching experience. This exclusive tour offers tropical refreshments including homemade banana bread with lilikoi cream cheese and coconut water. They offered this tour at 8:45am, 11am, and 1:30pm. NCL cruise ship passengers in Kahului are able to do a whale watch on either day they are in port in Kahului. Lahaina whale watches (which we prefer) are an hour drive by rental car. We can arrange a rental car with shuttle pick-up at the harbor for $39 per day; see our rental car page for more information. Lahaina cruise ship passengers can do whale watching while in port since the Whale Express and Spirit of Lahaina both leave from the same harbor where your cruise ship tender arrives. You can book either the midmorning, noon, or early afternoon time slots. No, you don't have to go on a boat to see whales. During the peak season (mid-January to mid-April) it is very common to be able to see whales from the shore. But these sightings are usually pretty far away ... it is not a particularly impressive sight to watch a whale jump out of the water three miles away. And these creatures are SO impressive when you experience them close-up. There is a big difference between SEEING a whale and EXPERIENCING a whale. 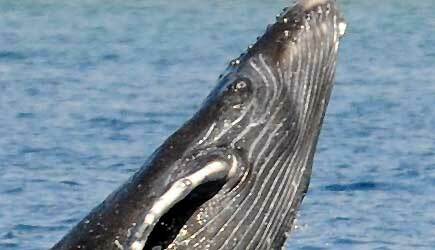 There is a popular whale watching site along the Pali Highway a few miles west of Maalaea Harbor. The scenic overlook there is often packed during peak whale season with people who are too cheap to spend $30 to really experience these gentle giants. Do yourself a favor ... go on a whale watching cruise. 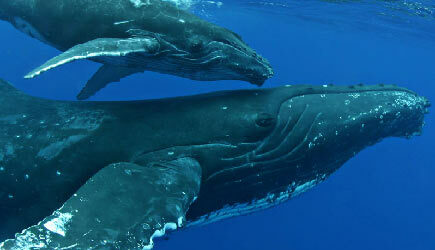 The Humpback Whales begin to arrive in November, and most of them have arrived by the beginning of January. Whale Searches usually begin sometime around Thanksgiving ... sightings that early in the season may not be guaranteed. That changes in December. During the peak season all the boats guarantee that you will see whales. If you are here in February you won't have to worry about getting skunked ... it will be whale soup out there! They love the warm, shallow waters between Maui, Kahoolawe, Molokai, and Lanai. There are so many boats that do whale watching, I couldn't even begin to list them here. My favorite boat is the Whale Explorer because it is a smaller, FAST boat which guarantees you spend less time getting to the whales and more time actually watching them. This kind of raft isn't for everyone though; they don't allow anyone with neck or back injuries or anyone pregnant as the ride can be bumpy at times. How close will you get to the whales? That depends on the whales. By law, the boats must stop 100 yards away from a whale. They are incredibly curious animals though, and they OFTEN approach much closer than that. Sometimes they mug the boat, and you may get the rare treat of smelling whale breath! 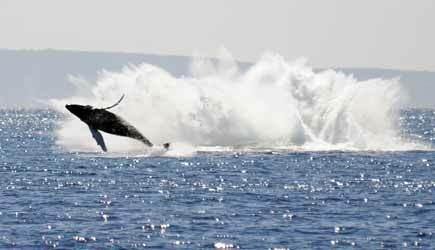 The sound of a spouting whale is something you will not forget ... it is much like the puff of a steam engine locomotive. Best time of day? The whales will put on a good show anytime you like. The morning tends to be less windy though. The mid-morning trips usually fill up a few days in advance, so reserve in advance to get the best time of day! ***Only the Teralani offers a teen rate. Teens will be charged the adult rate on all other boats. Child and infant ages vary by boat.